The posthumous sequel to Who Moved My Cheese?, the classic parable that became a worldwide sensation. Who Moved My Cheese? offered millions of readers relief for an evergreen problem: unanticipated and unwelcome change. Now its long-awaited sequel digs deeper, to show how readers can adapt their beliefs and achieve better results in any field. Johnson's theme is that all of The posthumous sequel to Who Moved My Cheese?, the classic parable that became a worldwide sensation. Who Moved My Cheese? offered millions of readers relief for an evergreen problem: unanticipated and unwelcome change. Now its long-awaited sequel digs deeper, to show how readers can adapt their beliefs and achieve better results in any field. Johnson's theme is that all of our accomplishments are due to our beliefs: whether we're confident or insecure, cynical or positive, open-minded or inflexible. But it's difficult to change your beliefs--and with them, your outcomes. Find out how Hem, Haw, and the other characters from Who Moved My Cheese? deal with this challenge. 4 Stars! This was a real unique read. My Dad and I have been able to read all of Spencer's books together. When I heard a new one was coming out, I knew that I had to read with him again. Thanks so much to Portfolio/Putnam for gifting us copies to read together! Have you ever felt stuck in life? Do you feel like the possible is actually impossible? This book tells a story of a mouse called Hem who is stuck in his own maze, aka his "safe life". He is too scared and too much in denial to try to get 4 Stars! This was a real unique read. My Dad and I have been able to read all of Spencer's books together. When I heard a new one was coming out, I knew that I had to read with him again. Thanks so much to Portfolio/Putnam for gifting us copies to read together! Have you ever felt stuck in life? Do you feel like the possible is actually impossible? This book tells a story of a mouse called Hem who is stuck in his own maze, aka his "safe life". He is too scared and too much in denial to try to get Out of the Maze however his friends have already taken the risk. Initially, instead of trying, he gets mad and can't believe they that. He then comes along a mouse called Hope. Hope doesn't try to tell him what to do but rather challenges him with questions of "why do you feel that way?" "why do you think it's impossible to belief something else?" Eventually Hem realizes that sometimes when you take risks that the impossible does become possible. He also realizes that just because you think something doesn't mean it has to be your belief. This book was a sequel to Who Moved my Cheese and it's the next step in the process of acceptance, flexibility and adaptability in life. These books teach you how to think a new way and really enrich your life and a positive way. I loved that I got to read this with my Dad. It was a special discussion and I feel like when we get to read together, it brings us closer in a unique way. We were both able to come to the same conclusions from the book and we had about an hour conversation about how we can think differently in all ways of life. If you're looking for a self help book this is great. I recommend reading Who Moved My Cheese first. I also highly recommend The Present - it's how to live in the moment and it's been SO helpful in the way I think about life. These books are special. I'm sad Spencer passed away in 2017 however he wrote a letter in the back of this book about how he actually loved his illness because it helped him appreciate what is truly around him. I loved that this is the way the book ended. Thank you again for Portfolio/Putnam for our gifted copies! Does it lift you up or hold you down? Simplifies life’s challenges and teaches you how to adapt and get after your goals. A sequel to Who Moved My Cheese?. A nice homily about opening your mind to new ideas. It will be a useful tool for making teams think about working better together and bringing everyone on board, even the Luddites. With thanks to NetGalley and Penguin Random House UK / Ebury Publishing for a free review copy. Out of the Maze is the post-humous sequel to Who Moved My Cheese. It's short and doesn't mince words while addressing questions left over from the first book, namely, "how can I adapt?" Most of the book covers Haw, the Littleperson who's looking for cheese in the maze and is struggling to find it. Haw has to address where he's at, and after finding Hope, he's able to move on toward success. I think it's a great guide for those who feel trapped where they're at. Letting go of old beliefs. A business fable and a follow-up to a famous "Who moved my cheese?". Many thanks to the publisher and NetGalley for sharing the ARC. I see what the author is trying to do here and why fable is chosen to deliver the message... But personally, while I agree with the premises and conclusions - I did not enjoy the delivery style. It felt a little too patronising for my liking - hence my rating. Having said that, if you enjoyed "Who moved my cheese?" - chances are you will enjoy the sequel as well. I first read the prequel to this book Who Moved My Cheese over 15 years ago and found it very helpful. Fortunately I listened to my audio version of Who Moved My Cheese just a few weeks ago. 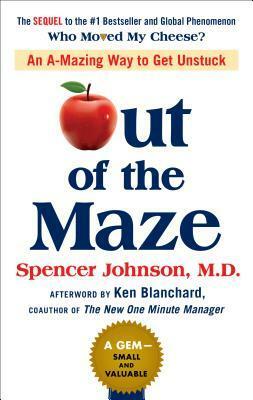 Out of the Maze written by the late Spencer Johnson follows on and is a very quick read. My honest opinion is that I think it would be most helpful as an addition to an edition of Who Moved My Cheese rather than a separate book whilst understanding the reasons behind it being separate. I think the value of Out I first read the prequel to this book Who Moved My Cheese over 15 years ago and found it very helpful. Fortunately I listened to my audio version of Who Moved My Cheese just a few weeks ago. Out of the Maze written by the late Spencer Johnson follows on and is a very quick read. My honest opinion is that I think it would be most helpful as an addition to an edition of Who Moved My Cheese rather than a separate book whilst understanding the reasons behind it being separate. I think the value of Out of the Maze is gained best after reading Who Moved My Cheese and not as a standalone. The reference to Spencer Johnson's life and the way he dealt with his latter months of life serves a very strong testimony and sums up the message of Out of the Maze. Thanks to NetGalley and to Ebury Digital for providing me an ARC copy of this book that I freely chose to review. Although Who Moved My Cheese? was published a long time ago (in 1998) and I had seen it around, I only learned more about it when I was working on the translation of a self-help book. The author referred to Johnson’s fable in his text and I had to check it out. When I saw this sequel announced on NetGalley I felt curious. Most of you will be familiar with the first book, but in short, Thanks to NetGalley and to Ebury Digital for providing me an ARC copy of this book that I freely chose to review. Although Who Moved My Cheese? was published a long time ago (in 1998) and I had seen it around, I only learned more about it when I was working on the translation of a self-help book. The author referred to Johnson’s fable in his text and I had to check it out. When I saw this sequel announced on NetGalley I felt curious. Most of you will be familiar with the first book, but in short, it is the fable of two mice and two little people who live in a maze and feed on cheese that magically appears every day. Suddenly, after things have been like this for a long time, the cheese disappears. The two mice go as well, seemingly looking for more cheese, but the two little people don’t agree on what to do. One of them decides to try to find more cheese, while the other stays put, convinced that things will go back to the way they were soon enough. As is the case with all good fables, lessons are learned. In this book, the central fable is framed by a discussion group. The class has been talking about the original book, and one of the students asks what happen to the character left behind. The teacher then comes back with a story, which is the follow-up to the previous one, but this time the protagonist is Hem, the character left behind. Throughout the book he meets hope, has to confront his set of beliefs, and learns invaluable lessons. Like the previous one, this book is really short, under 100 pages, and that includes a note from one of the author’s collaborators and some background to this work. The author died from pancreatic cancer in 2017, and the story of how he handled his disease (including a letter he wrote to his cancer) is also an important part of the book. The book, like its predecessor, does not provide brand-new ideas or earth-shattering insights. Having said that, the lessons become easier to remember because they are provided in the format of a fable. Having the distance and the perspective afforded by reading about imaginary characters in an imaginary situation allows people to think about their own lives and find similarities in outlook that might not be welcome if pointed out directly or if our behaviour is confronted head-on. Realising something for oneself is much more effective and causes less resistance than having somebody tell us where we went wrong. The discussion group and its members also provide some examples of real-life situations and how to deal with them. In sum, this is a short book, written in simple language, easy to read, and it can be useful to people who feel stuck in a rut and cannot see a way forward. It would also provide useful and easy read to course facilitators looking into topics such as belief-systems and how to change one’s perspective. Great book! I liked this even better than Who Moved My Cheese and I feel like this book really completes the original and compliments it quite well. I will absolutely apply many lessons from this book to my career and my personal life. I really like how author, Spencer Johnson conveyed so much wisdom through two, easy to read parables. I read this book in a little over an hour and the effort was well worth the rewards. Special thanks to Sergio Sarinana for introducing me to Who Moved My Cheese a Great book! I liked this even better than Who Moved My Cheese and I feel like this book really completes the original and compliments it quite well. I will absolutely apply many lessons from this book to my career and my personal life. I really like how author, Spencer Johnson conveyed so much wisdom through two, easy to read parables. I read this book in a little over an hour and the effort was well worth the rewards. Special thanks to Sergio Sarinana for introducing me to Who Moved My Cheese and Out of the Maze! Human beliefs are divided in two categories: the core and the peripheral. Core are considered your strong beliefs, your values and guiding principles. The more flexible ones , the ones that are easier to change are considered your peripheral principles Like explained in the book, to overcome difficulties, you must adapt to change and not be too confident of your state and status - the only constant thing in life is change. Sometimes altering patterns may appear scary but in essence , essential . This sequel by the late Dr. Johnson expands on the ‘who moved my cheese’ fable which has been applied to various business thinking concepts and ideologies. It’s not the best business self-help book out there but not the worst. It’s a little bland and repetitive but short enough to get through it. Helpful and insightful addition to the classic, "Who Moved My Cheese." This book examines beliefs, how beliefs keep us from moving forward to find new cheese, and how to overcome and adapt to new beliefs to help create new experiences. It thoughts how our belief can change anything. Beliefs can lift us up or bring us down. Life is not only in the maze you have to think outside of maze. Short and sweet with a powerful message. The message is simple in concept that can be impactful if reflectively internalized. Great new thought process. Make sure to read Who Moved my Cheese first. The two books go hand-in-hand and will complement each other. Never be left behind and caught in your own devised "maze". Keep on thinking and have hope. * Old believe do not lead you to new cheese. I believe this book came into my life in the right moment. I can't express how much I am inspired by the story and how much it motivates me to look for my own "Cheese" and better, "Apples". It inspires readers to think outside of the box (changing your beliefs/thinking) so that you could unlock success (reach endless possibilities & better outcomes). The quote that was written in the book, "changing what you think doesn't change who you are" , really stuck with me. I, like Hew, am still try I believe this book came into my life in the right moment. I can't express how much I am inspired by the story and how much it motivates me to look for my own "Cheese" and better, "Apples". It inspires readers to think outside of the box (changing your beliefs/thinking) so that you could unlock success (reach endless possibilities & better outcomes). The quote that was written in the book, "changing what you think doesn't change who you are" , really stuck with me. I, like Hew, am still trying to get out of the Maze and couldn't be more grateful that this book came and provided guidance to enlighten my 'journey'. You’ve got to read this for what it is - a parable-sequel, self-help style, simple story about people living in a maze of cheese. It sounds simple truths, but ones that need reiterating often in society and specifically the business world. It’s a sequel, but doesn’t need to be read in conjunction with the first book, Who Moved My Cheese. I read this book thanks to Blinkist. I’d rather read about the power of belief in a way that’s not written for 4 year olds. The key message in these blinks: It can be difficult to let go of old sources of happiness or success and the beliefs we develop about them, but it is possible to change those beliefs and find new sources of fulfillment. The key is to cultivate an openness to possibilities, let go of fears and to join forces with other people in our journey through life. Actionable advice: Exami I read this book thanks to Blinkist. I’d rather read about the power of belief in a way that’s not written for 4 year olds. The key message in these blinks: It can be difficult to let go of old sources of happiness or success and the beliefs we develop about them, but it is possible to change those beliefs and find new sources of fulfillment. The key is to cultivate an openness to possibilities, let go of fears and to join forces with other people in our journey through life. Actionable advice: Examine your beliefs. • To examine your beliefs, you can start by dividing them into two categories: Core beliefs and peripheral beliefs. • Your core beliefs are your values and guiding principles – the things you care about, want to see happen in the world and provide you with a sense of purpose. These could range from believing strongly in defending human rights or wanting to alleviate other people’s suffering, to believing in yourself and the idea that your existence serves some sort of greater purpose. These beliefs don’t change, at least not in the short term. They’re at your core. • Around them, you acquire many other beliefs that are more flexible and fleeting. Many of them have to do with the way you think you need to approach your core beliefs. These are the beliefs that are worth examining and possibly changing. For example, someone who wanted to help other people could think that being a doctor was the best way for him to do that – but, upon reflection, he could decide it’s by writing books, a realization that the author himself had. What to read next: Who Moved My Cheese?, by Spencer Johnson You’ve just learned the tale of Hem and the life lessons he discovered on his journey out of the maze. Now would be a great time to discover or revisit the story to which this one was the sequel. The original parable contains more lessons on the nature of change and the secrets to dealing with it. Given the fact that it was a worldwide bestseller, there’s a good chance that you’ve already read it. But even if that’s the case, you can now return to its lessons, consider them in a whole new light and connect them to the lessons of the sequel. Whether you’re new to the book or already familiar with it, we highly recommend checking out the blinks to Who Moved My Cheese? Review: https://heyitsbookishme.wordpress.com... After 20 years of success with Who Moved My Cheese?, Spencer Johnson returns with a sequel, Out of the Maze. Unfortunately, due to his passing in July 2017 from pancreatic cancer, he was unable to feel the finished copy in his hands. This book was made possible thanks to his 3 sons, and Ken Blanchard, his coauthor and good friend. Out of the Maze is a continuation of the first book, Who Moved My Cheese?, now sharing littleperson Hem’s journey in loo Review: https://heyitsbookishme.wordpress.com... After 20 years of success with Who Moved My Cheese?, Spencer Johnson returns with a sequel, Out of the Maze. Unfortunately, due to his passing in July 2017 from pancreatic cancer, he was unable to feel the finished copy in his hands. This book was made possible thanks to his 3 sons, and Ken Blanchard, his coauthor and good friend. Out of the Maze is a continuation of the first book, Who Moved My Cheese?, now sharing littleperson Hem’s journey in looking for cheese to eat. Ever since his best friend, Haw, left to find “new cheese”, Hem felt helpless and sad. There was a lot of regret oozing through his veins – why didn’t I follow Haw when I could? From his initial times of appreciating his comfort zone over the great journey towards “nothingness”, as Haw did, he soon felt that he needed to do something, for fear he would die of loneliness and hunger. We will follow Hem’s journey closely as he discovers new opportunities and hope, deals with self-doubt, experiences stages of realisation and ultimately, masters the art of letting go to gain something so much better. Sometimes, we tend to be so used with our old ways that we close our eyes to possibilities out of our space. This simple story of Hem teaches us that there is more to discover if you allow yourself to just, try. Baggage of the past should be left where it belongs, the past. Instead, take those lessons and be the best version of yourself today, and in the future. Towards the end of the book, you will find a short letter written by Spencer Johnson before he died. It is both heartfelt and inspiring, so I share this review with hopes that more people will read his story and appreciate all the simple yet meaningful lessons he imparted and embodied during his life. Now then, I leave you with this – "What would you do if you believed it was possible?" Rating: ★ ★ ★ ★ I would like to thank Times Reads for this review copy in exchange for my honest review! Out of the Maze is the post-humous sequel to Who Moved My Cheese. Most of the book covers Haw, the Littleperson who's looking for cheese in the maze and is struggling to find it. Haw has to address where he's at, and after finding Hope, he's able to move on toward success. I think it's a great guide for those who feel trapped where they're at. Great book!I will absolutely apply many lessons from this book to my career and my personal life. I really like how author, Spencer Johnson conveyed so muc Out of the Maze is the post-humous sequel to Who Moved My Cheese. Most of the book covers Haw, the Littleperson who's looking for cheese in the maze and is struggling to find it. Haw has to address where he's at, and after finding Hope, he's able to move on toward success. I think it's a great guide for those who feel trapped where they're at. Great book!I will absolutely apply many lessons from this book to my career and my personal life. I really like how author, Spencer Johnson conveyed so much wisdom through two, easy to read parables. I read this book and the effort was well worth the rewards. Helpful and insightful addition to the classic, "Who Moved My Cheese." This book examines beliefs, how beliefs keep us from moving forward to find new cheese, and how to overcome and adapt to new beliefs to help create new experiences. The books picks where the previous one left and tells the story of how you can get out of the maze. Through the story the author reveals that our beliefs are the things that hold us back. As the saying goes if a belief is not helping you should change it so thus the story illustrates when Hem changed his beliefs by dropping the one that put him down and adopting the ones that lift him up, he was able to get out of the maze. I can't express how much I am inspired by the story and how much it motivates me to look for my own "Cheese" and better, "Apples". It inspires readers to think outside of the box. it was an amazing read, fast one for sure. /along with its prequel this book should be read over and over again and shared as much as possible. I gave this book 4 stars because it was a great next “chapter” to the ‘Who Moved My Cheese?’ book, and it was thought-provoking. This book was published in 2018 (20 years after the original), and it took me 59 minutes to finish it (less than an errand to get my winter tires off my car). On Amazon, it’s sold under the “business motivation” and “self-improvement” genres, which represents about 20% of the books I read. I chose it because of my cat-killing curiosity about what happened next, the cut I gave this book 4 stars because it was a great next “chapter” to the ‘Who Moved My Cheese?’ book, and it was thought-provoking. This book was published in 2018 (20 years after the original), and it took me 59 minutes to finish it (less than an errand to get my winter tires off my car). On Amazon, it’s sold under the “business motivation” and “self-improvement” genres, which represents about 20% of the books I read. I chose it because of my cat-killing curiosity about what happened next, the cutesy storytelling style, and it was short. It was my second book by Spencer Johnson, who died of pancreatic cancer in 2017. This simple book is the long-awaited sequel to ‘Who Moved My Cheese?’ and whereas the first one focused on change, this one focuses on the power of beliefs. The author gives a quick recap of the first book, and then in an identical style, let’s us watch what happens to Hem who was stuck in the maze. I felt it did a satisfying job of both going a bit deeper in the conversation and giving us closure. I would love to see kids get their hands on both books by middle school, and facilitated group discussions would be even better (just like they demonstrate, and for all ages). I wrote down three inquiries as I listened: (1) which of my beliefs serve me? (2) how do I teach my kids about beliefs? and (3) does changing our beliefs change our identity? On that last one, the book argues that they do not, but I wonder. I think most people’s egos take a change of identity as a threat, but I do not. Out of the Maze is a Post-humous book by Spencer Johnson, and is the sequel to his immensely popular book, “Who Moved My Cheese”. I would have to honestly admit, That I have not read the first book, but you would be hard pressed to find a person that had not have heard about his book, that was released over 20 years ago. This sequel explores what happened to the Little Person, Hem, That was left behind by both the mice, and his partner Haw, Which left in pursuit to find cheese. Hem is a character Out of the Maze is a Post-humous book by Spencer Johnson, and is the sequel to his immensely popular book, “Who Moved My Cheese”. I would have to honestly admit, That I have not read the first book, but you would be hard pressed to find a person that had not have heard about his book, that was released over 20 years ago. This sequel explores what happened to the Little Person, Hem, That was left behind by both the mice, and his partner Haw, Which left in pursuit to find cheese. Hem is a character that loves cheese as much as anybody else, but at the same time is comfortable at where he regularly received his meals. What happens when one day it all stops, The others around him seem to adapt, and leave without him. How shall Hem, adapt and survive, while confronting old paradigms in his mind, and the feelings of being stuck to move forward, as painful as it may sound. (Something I can personally relate with) This book, although short is an analogy of our individual lives, and how by thinking outside of the box, We can perhaps come up with solutions for when an opportunity ends, We may find a new one by thinking outside of the box. (P.S. At the end of the read, I felt that the mice, and Haw were assholes for not looking for Hem, for all that Hem thought about when he had a breakthrough was sharing it with the rest). This review has been hidden because it contains spoilers. To view it, click here. This is a suitable book to close Spencer’s catalogue of bite-sized business/personal development books. (He passed away shortly before the release of this book.) This parable discusses what happened to Hem at the end of “Who Moved My Cheese” as the previous book follows Haw as he leaves to find new cheese when somebody moves it. The story starts off with Hem moping around waiting for new cheese is to be given to him, and upset that his friend left him there. His hunger sets him off on a journey t This is a suitable book to close Spencer’s catalogue of bite-sized business/personal development books. (He passed away shortly before the release of this book.) This parable discusses what happened to Hem at the end of “Who Moved My Cheese” as the previous book follows Haw as he leaves to find new cheese when somebody moves it. The story starts off with Hem moping around waiting for new cheese is to be given to him, and upset that his friend left him there. His hunger sets him off on a journey to find more cheese, and over the course of the book he he learns lessons about how his beliefs are trapping him. He befriends a woman named Hope who helps him see things from an alternate perspective. He realizes that his old beliefs don’t help him find new cheese, and later that he might be in a maze that he can get out of. After a few lessons and personal growth, he escapes and finds his friend Haw. The bonus material in the book was a fitting closure for his final book. Spencer’s letter to his tumour was very moving, as well as Kenneth Blanchard’s heartfelt afterward. I would have rated the book a five out of five, but because the book is so short, even for Spencer Johnson’s standards, I rated it a four out of five. This book is a very easy and quick read that communicates a universal truth and is worth borrowing to read.